This week I’m working on refurbishing a bracelet design from many years ago. I recently pulled some old jewelry out of my stash and starting wearing it, and I was happy to discover that although I had decided to take most of them out of my shop for one reason or another, they’re actually right at home in my own wardrobe. One of my favorite pieces right now is a right angle weave cuff with a fall ombré palette. I like it so much that I really want to see if I can rework it to fit my shop right now. It took a while to decide how I was going to work the pattern, since there’s very few ways to create any kind of order in openwork raw like this. Most rows are shared with other sections, so stripes aren’t easily rendered. As I was imagining different possibilities, I thought of doing black and white stripes between sold cells of color and a little lightbulb went on. I decided to keep the 3-bead cells intact for now, so I had to go with alternating rows of black and white instead of stripes within them, but so far I’m loving how it looks. I’m planning to add a little ombré to this new cuff as well, but all in blue. The new broad collar that I was working on turned out perfectly, even though the hammer shell heishi are a little bulky. The pattern of 8/o and 6/o beads along the center nets came out especially nice, and I plan to incorporate it into a similar design sometime in the future. I also found time to whip up a strung necklace with turquoise glass and gold pearls. If colors can be controversial, pink is definitely near the top of the list. I myself have never been much of a pink fan, not only because I prefer darker hues, but also because it’s been so gendered and stereotyped. 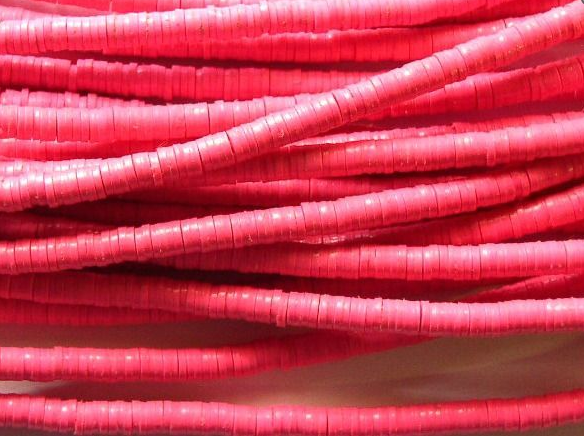 Even in recent years, I found pink to be just a bit too youthful, at least for my beadwork designs. And yet, that vitality does have its allure. Pink is becoming much less gendered now, particularly in fashion. Perhaps it’s time to take another look at this color. Pink is the color of many things that are delicious, like bubblegum and strawberry ice cream. It can be found in amazing places like a really great sunset or at the bottom of the sea. Many things just wouldn’t be the same without pink, such as flamingos, the art of Lisa Frank, or the Japanese Hanami festival. And did you know that the name for this color sort of has the same roots as the shears that create a scalloped edge to fabric? How do you feel about the color pink? 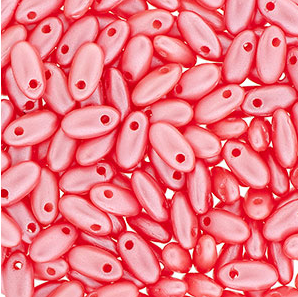 What’s your favorite way to incorporate it into beadwork or jewelry? Progress is being made on projects this week - the new baroque pearl medallion is complete, and the collar I had planned is underway. I am happy to report that this time around it only took me two tries to get a pattern that I liked, although the first one turned out so wrong that I almost gave up. A slight reworking of the palette and some compromises in the pattern that I wanted brought out the best in the beads that I had picked, and it looks like everything is going to turn out great. I still have to string the new medallion, but I’ve made a habit of saving up a handful to string all at once so that I can save time cutting cord and lacquering knots. I ended up asking my little helper for some color advice on this one, which prompted a request to make some new medallions with his unique input. I definitely think they’re be some knew embroidery designs on the horizon. Right now I feel like I have all the time I need to come up with new design ideas, so naturally I’m having trouble deciding what to make or where to start. Experimenting with color palettes is always a good place to find a kernel of an idea, so this month I thought I’d start with some unused bugles from my seed bead stash. The label calls this color patriot blue. I don’t know if it fits, but to me this color looks a lot more man-made than other shades of blue beads like turquoise, aqua, and cobalt. My challenge this time around would be to find ways to make it look less plastic-y and more organic. The first color I went for was white-lined black diamond, which is essentially an intricate gray. I paired this with lovely metallic iris olivine. Together I think the seed beads definitely have a rocky look, like something you’d find on a mountain hike. Although they do make the bugles look good, I think a deep turquoise would be even better for this trio. Next I turned to an all-new color that I’ve been dying to use. 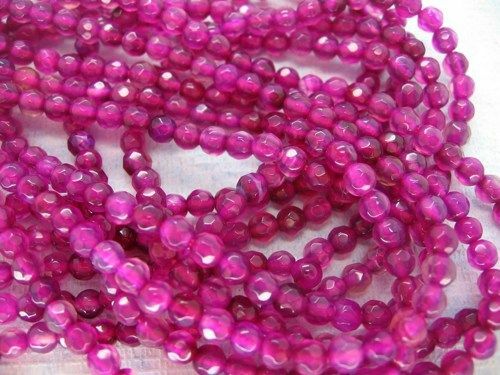 I ordered some of these sol gel rainbow rose seed beads for a cherry blossom project that ended up being scrapped. Now I keep hoping to find another way to use them in my regular designs, because they're incredibly pretty. I paired the rose with a custom mixture of whites and creams, hoping that the non-opaque seed bead duo would help the bugles out. I love this combination, though I think it would need a very careful application to get an organic look. Finally, I found the magic ingredients. As I got to the end of my stash of colors, I was thinking about some yellow iris but turned to transparent lime iris instead. I was looking for another great shade of green to use when I considered checking out the blues I had skipped over to see if anything would work. Aqua white-hearts did the trick, and all three of these colors together could look gorgeous in an aquatic or garden-inspired design. 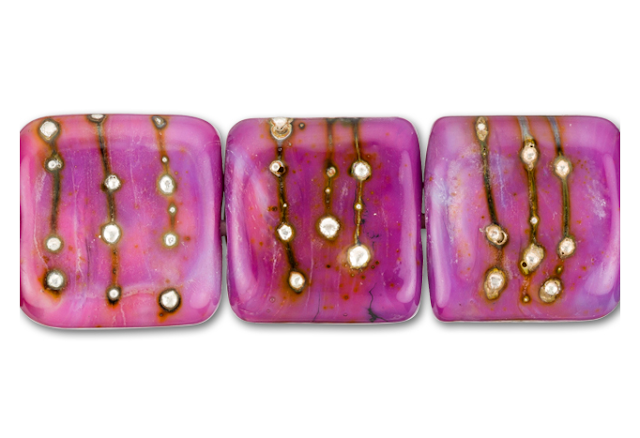 Have you ever come across a bead that just couldn’t be worked into a palette? How did you end up using it? A Month Without Seed Beads? 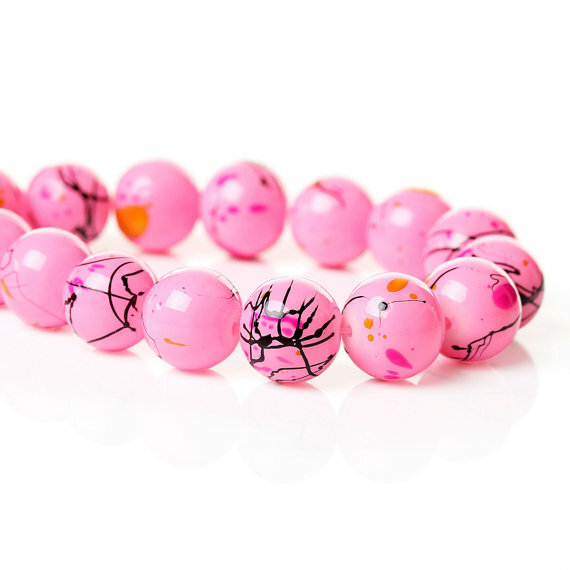 Our latest bead giveaway has closed, and our winner is Stephanie! Congratulations to her, and thank you so much to everyone who joined in. For this giveaway, we explored the beady offerings at Inspirational Beading sponsor PandaHall.com. Stephanie’s pick was the seed beads - an excellent choice in my opinion! Even if you’re out of pearls and spacers, you can still make an entire project – clasp, focal and all - with nothing but seed beads. 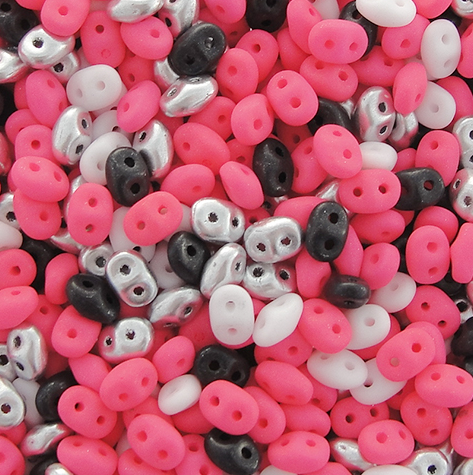 If you had to go a whole month without using seed beads in your designs, what would you make? 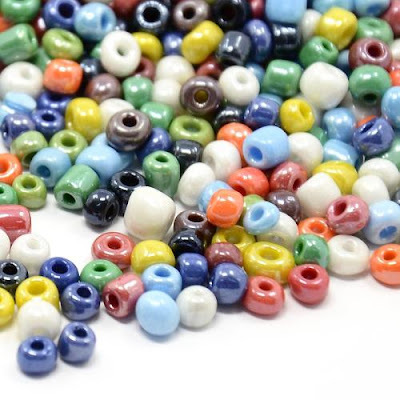 My plan to simultaneously clean up my workspace and search for new inspirations in my bead stash worked splendidly – almost too well, in fact. I still have to finish tying off the threads from the new chevron collar, and then I’m going to do a quick medallion pendant with some baroque pearls and a fish leather backing. It took some time to come up with a palette that I liked and that worked well with the burgundy color. Part of me really wanted to go with black and white stripes, but I’ve done it that way once before, and I’m looking to try something a little different this time. As soon as that’s complete, I have plans for a somewhat elaborate collar featuring some hammer shell heishi that I’ve been sitting on for ages. I couldn’t resist getting the palette ready, so my bead tray is a little crowded right now. I haven’t yet had a chance to really comb through my stash and see what inspirations await, but I do have a few new materials waiting in the wings that I’m looking forward to trying out. Once I find the right combinations for these, there’s a chance I won’t have time for all of the ideas they bring out. A few weeks ago I snagged this lovely strand of millefiori beads while thrifting for summer clothes, and I couldn’t be more in love. There’s just something gorgeous about the combination of white and yellow with a black backdrop. The translucent core makes these beads different from any of my other druks and rounds. I like these ones almost too much to use! During a recent thread stock-up, I couldn’t resist trying out some Czech glass triangle beads. 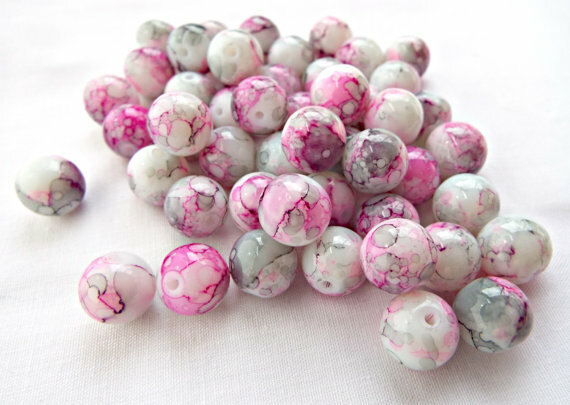 These are a single-hole variety, and although the shape is clearly a triangle from the top down, the sides of these beads look very curvy and organic. I’ve already tested them out in yellow, but this red is really calling out. It sounds like “pair me with turquoise”! It might be a coincidence that all of my current favorites are on strands, just waiting to be cut. Either way, I’m really looking forward to seeing what these freshwater pearls can do. I’ve been a fan of the coppery finish for years, but I haven’t used pearls these small for ages. At about 5mm, they’re certainly small enough to go with just about any stitch, and I love the semi-round shape. 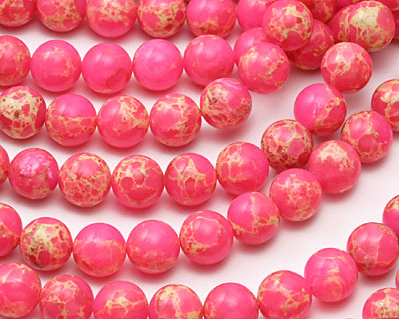 What are your favorite beads of the moment? I’ve finally finished the very long Potawatomi chain project that I was working on, and it turned out great! I often forget just how time consuming multi-strand projects can be when each strand is woven. To celebrate, I’ve started a quick double-chevron collar with some black SuperDuos and white Rizos. After that, who knows? I'll have to take a really good look through my stash for some inspiration. Taking photos of my work today made me realize that my trusty bead tray is starting to look a bit worse for wear. It’s suffered quite a few cracks and chips over the years, mostly due to trying to lift it one-handed while it’s covered in beads. Hopefully it has a few more good years in it before I have to trade it in for something new.